CNC TECH TALK MMS AUGUST 2018 38 mmsonline.com Processes and Programming AUTHOR | Mike Lynch Founder and President, CNC Concepts Inc. DEBURR ANY CROSSHOLE www.jwdone.com • Determining the need for brims and rafts can be compared to determining the need for special workholding devices. • Ensuring model adhesion to the build surface can be likened to what it takes to make a work- holding setup. • Considerations surrounding support struc- tures (and how to limit the need for them) can be compared to considerations surrounding work-sup- port devices like tailstocks and steady rests. • Changing the filament can be compared to preparing and measuring tool assemblies and entering offsets. 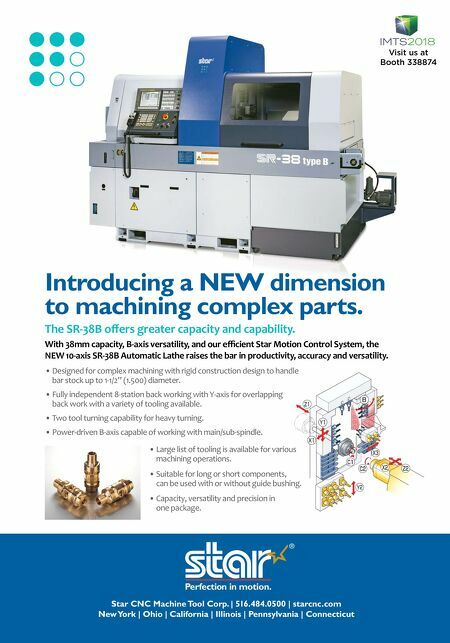 • Determining and applying clearances for mating components can be compared to sizing adjustments for machined parts. Although these comparisons are limited to FFF 3D printers, similar issues impact other forms of AM (such as resin and metal types). Admittedly, some of the comparisons are a bit far-fetched, but they should nicely illustrate the kinds of things a typical design engineer does not know about CNC technology. If a design engineer does not fully understand the technologies surrounding the type of AM equipment being used, they are in for a lot of failed prints. In similar fashion, if a design engineer does not fully understand the technologies surrounding any kind of subtractive manufacturing equipment, manufacturing costs are probably higher than they should be. 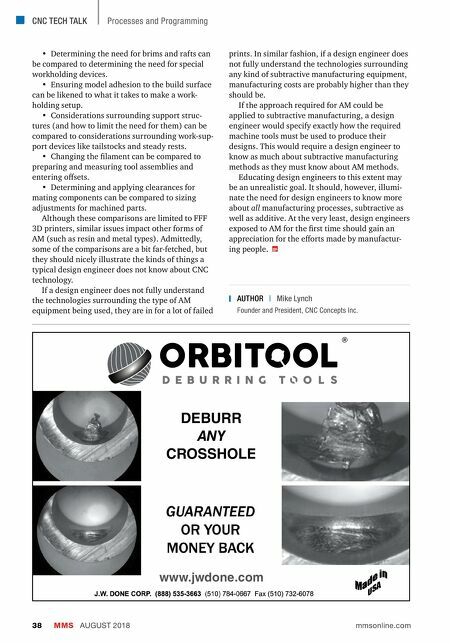 If the approach required for AM could be applied to subtractive manufacturing, a design engineer would specify exactly how the required machine tools must be used to produce their designs. This would require a design engineer to know as much about subtractive manufacturing methods as they must know about AM methods. Educating design engineers to this extent may be an unrealistic goal. It should, however, illumi- nate the need for design engineers to know more about all manufacturing processes, subtractive as well as additive. At the very least, design engineers exposed to AM for the first time should gain an appreciation for the efforts made by manufactur- ing people.